Was born November 15, 1914 in Ft. Cobb, OK to William and Eva (Ford) Shipton. She passed away at the age of 94 in Chickasha, OK on April 25th. After graduating from high school, she married Victor E. Oswald on June 30, 1936 in Wichita Falls, TX. Together they farmed in the Broxton Community. Loyce was a devoted homemaker whose passion was raising her family. 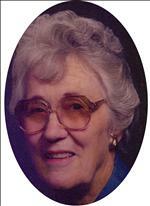 She served as president of the Caddo County Home Extension Club in the early 1950's. One of her favorite things to do was drive a wheat truck! She also enjoyed embroidery, raising chickens, and cooking. She was a part-time cook at the Broxton school and at home made the best fried chicken and apple pie in the county. A faithful member of the First Baptist Church of Apache, Loyce worked in the nursery for over 30 years. In 1999, she retired and moved to Chickasha where she lived until moving into Brookdale Senior Living Center in 2005. 13 grandchildren and 19 great-grandchildren. Services will be held Monday, April 27th at 2:30 P.M. at the First Baptist Church of Apache with Reverend A.L. Swagerty officiating. Burial will follow in Gotebo Cemetery under the direction of Crews Funeral Home of Apache.